The Earth behaves like an enormous electric circuit. The atmosphere is actually a weak conductor and if there were no sources of charge, its existing electric charge would diffuse away in about 10 minutes. There is a 'cavity' defined by the surface of the Earth and the inner edge of the ionosphere 55 kilometers up. At any moment, the total charge residing in this cavity is 500,000 Coulombs. There is a vertical current flow between the ground and the ionosphere of 1 - 3 x 10^-12 Amperes per square meter. The resistance of the atmosphere is 200 Ohms. The voltage potential is 200,000 Volts. There are about 1000 lightning storms at any given moment worldwide. Each produces 0.5 to 1 Ampere and these collectively account for the measured current flow in the Earth's 'electromagnetic' cavity. The Schumann Resonances are quasi standing wave electromagnetic waves that exist in this cavity. Like waves on a spring, they are not present all the time, but have to be 'excited' to be observed. They are not caused by anything internal to the Earth, its crust or its core. They seem to be related to electrical activity in the atmosphere, particularly during times of intense lightning activity. They occur at several frequencies between 6 and 50 cycles per second; specifically 7.8, 14, 20, 26, 33, 39 and 45 Hertz, with a daily variation of about +/- 0.5 Hertz. So long as the properties of Earth's electromagnetic cavity remains about the same, these frequencies remain the same. Presumably there is some change due to the solar sunspot cycle as the Earth's ionosphere changes in response to the 11-year cycle of solar activity. Schumann resonances are most easily seen between 2000 and 2200 UT. When we consider that the ionosphere surrounding our planet is electrically positive charged whilst the earth's surface carries a negative charge, we must conclude that this amounts to a prevailing electrical tension within the earth/ionosphere cavity. This tension is discharged when thunderstorms develop in this cavity. In physics two concentric electrically charged balls, one placed inside the other, are called ball condensers, or capacitors. The physicist and inventor Nikola Tesla was the first to carry out wireless energy experiments at Colorado Springs, USA, which produced such powerful electrical tensions that they resulted in the creation of artificial lightning. These lightning flashes also produced radio waves. Due to their extremely low frequency these waves could penetrate the earth without resistance and thereby Tesla discovered the resonance frequency of the earth. Unfortunately Tesla was way ahead of his time and his discoveries were not taken seriously because it suggested free energy for all and was not good for 'business'. It wasn't until more than half a century later in 1952, when the German physicist Professor W.O.Schumann of the Technical University of Munich predicted that there are electromagnetic standing waves in the atmosphere, within the cavity formed by the surface of the earth and the ionosphere. This came about by Schumann teaching his students about the physics of electricity. During a lesson about ball condensers he asked them to calculate the frequency between the inner and outer ball, meaning the earth and ionosphere layer. They came up with a calculation of 10Hz. This was confirmed in 1954 when measurements by Schumann and König detected resonances at a main frequency of 7.83 Hz. In the years following this discovery, several investigators worldwide have researched "Schumann resonance" and a number of properties and characteristics have now been established. It was Dr Wolfgang Ludwig who carried out further measurements whilst writing his thesis on the Schumann Resonance. His aim was to measure what kind of natural signals actually exist in a healthy environment. He became aware of the fact that due to man made electromagnetic signals within the atmosphere, the accurate measurement of Schumann waves was almost impossible in the city. For this reason he decided to take measurements out at sea where, due to good electrical conductivity, the Schumann waves are stronger. He than had the idea to take underground measurements in mines. Here he recognized that the magnetic field of the earth fluctuated too. This was also investigated by Dr Robert Becker in his book `Electricity and Vitality: The spark of Life'. Dr Ludwig came up with an excellent idea to take accurate measurements. When taking measurements at the earth's surface, the reading is the result of two signals, one coming from above and one from below. But subsequently taking measurements below ground makes it possible to come up with exact readings by separating the two. The Chinese teachings state that to achieve perfect health, both signals must be in balance. Dr Ludwig found that this is indeed the case. He writes in his book `Informative Medizin' that research carried out by E.Jacobi at the University of Duesseldorf showed that the one sided use of Schumann (YANG) wave simulation without the geomagnetic (YIN) signal caused serious health problems. On the other hand, the absence of Schumann waves creates a similar situation. Professor R.Wever from the Max Planck Institute for Behavioral Physiology in Erling-Andechs, built an underground bunker which completely screened out magnetic fields. Student volunteers lived there for four weeks in this hermetically sealed environment. Professor Wever noted that the student's circadian rhythms diverged and that they suffered emotional distress and migraine headaches. As they were young and healthy, no serious health conditions arose, which would not have been the case with older people or people with a compromised immune system. After only a brief exposure to 7.8 Hz (the very frequency which had been screened out), the volunteers health stabilized again. All the aforesaid points to the fact that the ancient teachings are correct. Mankind depends on two subtle environmental signals, the Yin from below and the Yang from above. 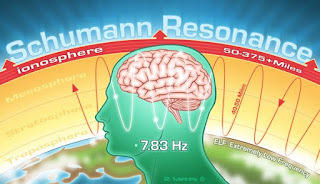 "Resonance : Beings Of Frequency" is a fascinating documentary which speaks of the Schumann Resonance of planet Earth and the effect it has on human health. Not only are we surrounded by natural frequencies, our bodies are filled with them too. Our cells communicate using electromagnetic frequencies. Our brain emits a constant stream of frequencies and our DNA delivers instructions, using frequency waves. Through his work, Gregg Braden shares scientific proof of the Earth passing through the Photon Belt and the slowing of the Earth's rotation. At the same time there is an increase in the resonant frequency of the Earth (Schumann Resonance). When the Earth stops its rotation and the resonant frequency reaches 13 cycles we will be at a zero point magnetic field. In 2 or 3 days it will start turning again in the opposite direction. This will produce a reversal in the magnetic fields around the earth and so forth. Americans who are paying attention to the landscape, sky, and surrounding notice a strange tower in the farm fields of Texas. Many thought it was a silo, while others thought it something strange that they would have to wear tinfoil hats...what is it??? Its Tesla, the inventor, and not the car company's invention for "FREE" wireless energy. A tower and the scientist behind it that every American should know and don't!!! Between Dallas and Austin Texas the next attraction and history Americans should read about and see...FBI lies??? A early experimental wireless transmission station designed and built by Nikola Tesla in Shoreham, New York in 1901–1902. 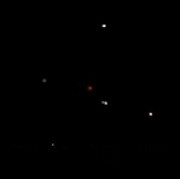 Tesla intended to transmit messages, telephony and even facsimile images across the Atlantic to England and to ships at sea based on his theories of using the Earth to conduct the signals. J. P. Morgan was supposed to fund the Tesla invention but backed out...who ended up and got rich on Tesla's technology. In an attempt to satisfy Tesla's debts, the tower was demolished for scrap in 1917 and the property taken in foreclosure in 1922.
Who is using free wireless energy while others pay??? Trump transparency is going to open that door, and maybe "All" Americans will have "FREE" energy!!! Tesla wanted the people to live live with ease and for people living in remote places to have free energy. Tesla lived and invented for the world, and greed robbed the people of the patents that were meant to make like for "ALL" and a better world for the future!!! As unpredictable as the current U.S. Presidential elections have been, a striking historical sidenote lies in their connection to the famous Serbian inventor Nikola Tesla. Donald Trumps Uncle was the MIT electrical genius who inspected Tesla's secret papers after Teslas death which were rumored to have time travel, alien communication and a deathray beam secrets. John G Trump is Donald Trumps Uncle and was the guy who examined Teslas papers at Teslas death! Trump was at MIT working on all types of radiation and atomic stuff! He died in 1985 the year Back to the Future was released. Tesla's entire estate from the Hotel New Yorker and other New York City hotels was transported to the Manhattan Storage and Warehouse Company under the Office of Alien Property (OAP) seal. Tesla's thoughts and efforts during at least the past 15 years were primarily of a speculative, philosophical, and somewhat promotional character often concerned with the production and wireless transmission of power; but did not include new, sound, workable principles or methods for realizing such results. In a box purported to contain a part of Tesla's "death ray", Trump found a 45-year-old multidecade resistance box.